When the Spanish missionaries arrived in California in the 18th century, estuaries and coastal wetlands were numerous. Gradually these tidal areas have been lost to development – first to commercial ports and then to yacht marinas and waterfront housing. By 1975 less than 10% of the original coastal wetlands remained between Santa Barbara and the Mexican border. In the 1960s planning proceeded in earnest on a commercial development that would have turned the Upper Bay into a large marina with private docks and waterfront homes. Concerned local citizens, including Frank and Frances Robinson, successfully fought these plans in court. At the same time the Friends of Newport Bay, through their leading-edge nature tours, played a big part in calling the public’s attention to the ecological importance of the Bay and enlisting broad support for the retention and protection of the Bay in its relatively natural state. As a result of their collective efforts, in 1975 the Upper Bay became an Ecological Reserve, managed by the California Department of Fish and Game. Additional acreage at Big Canyon was added to the Reserve in 1982. 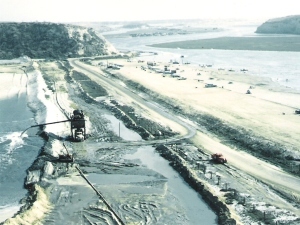 In 1990 the County of Orange acquired 140 acres of bluffs on the north and north-west sides of the bay for the creation of what is now known as the Upper Newport Bay Nature Preserve, managed by Orange County Parks. The Ecological Reserve and Nature Preserve together include about 1½ square miles of precious open water, mudflat, saltmarsh, freshwater marsh, riparian and upland habitat.